Navigation: Home » Economics » What Are the Most Common Side Jobs in America? What Are the Most Common Side Jobs in America? Whether you call it a side job, part time work, or a side hustle, Americans are an industrious bunch. How industrious? 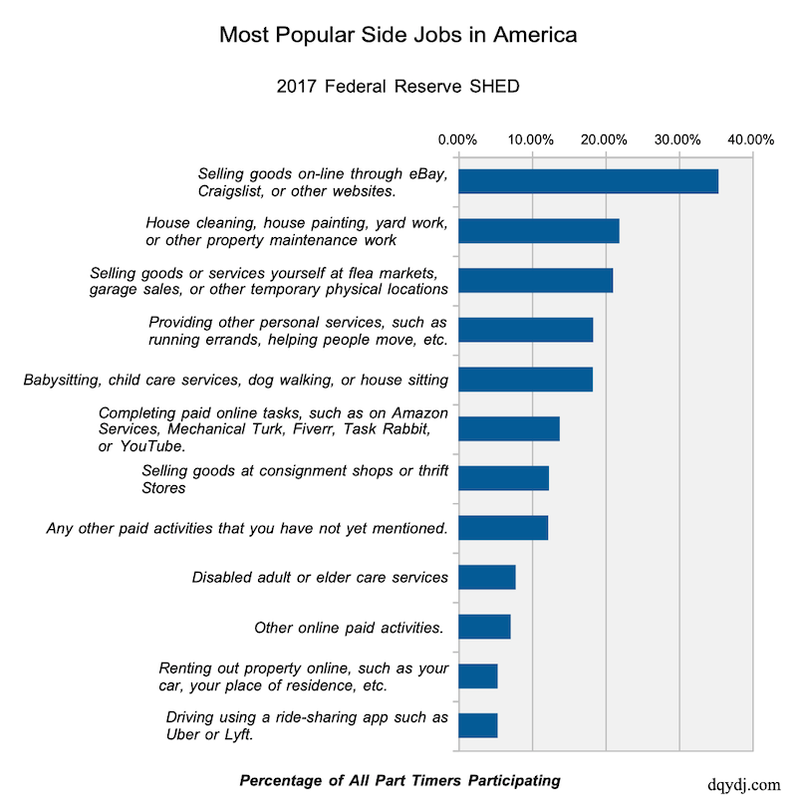 According to the 2017 Federal Reserve SHED, almost 31% of us work some sort of side job. Let’s explore the most common side jobs in America. By far, selling items online was the most popular side hustle. An estimated 10.86% of all adults (and 35.31% of all adults who earned side money) sold something online. On the flip side, ride-sharing and renting out goods or property are very rare side jobs for Americans. For both categories, only 1.64% of American adults participated in the previous month – roughly 4 million Americans did each. Most popular side jobs in the US: What side jobs can you do? Most popular side jobs in America in 2017. Surprised to see the current breakdown? Particularly, now knowing that 11% of American adults sold online feels high (even though we ourselves fit that definition).The ride-sharing and property numbers are about on point though. They mesh well with the gig economy statistics we saw from the Bureau of Labor Statistics earlier this year. As for ~ 31% of all American adults doing something on the side? Yes, we can see it. But hey, you’re here reading this site… perhaps we’re a little biased here? I really think to consider it a “side job”. They should qualify it as needing to be more than 1% of the money you earned that month. I sold an old washing machine online this month, and technically made money off it, but I wouldn’t call that a side job. My motivation was getting rid of a washing g machine that was taking up space in my garage. Now if you sold stuff online amounting to 5% or 10% of your total income, sure, that’s a side job. But mowing the lawn of the old lady next door twice a month to keep bugs and snakes out of your lawn, even if she pays you $20 each time, doesn’t really feel like a side job to me. I sold a fair number of things out of my closets and storage on eBay over the last month. Is that a side job on top of this side job? Wondering if I can take credit for a double. I had the same thought as Clint about the amount of money / time spent on the side job. I wouldn’t believe ~30% of us have significant amount of time/money on ‘side jobs’. But I could certainly see if 30% of us held a garage sale or sold a car or something.